Remembering the 70s and 80s. Explore the streets of Islington through stories of local activism against apartheid, for nuclear disarmament, rights for women and the LGBT+ community with a local CIGA guide. 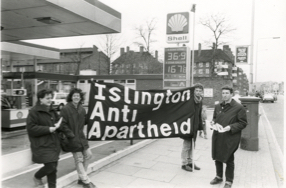 Presented in partnership with Islington Museum and inspired by their exhibition, Fighting Apartheid: Activism in Islington,this walk introduces the main sites where activists campaigned to bring about change.